1. In a small bowl, whisk together all the sauce ingredients. Set aside. 2. Heat the olive oil in a medium skillet over medium heat. Add in the ground chicken and let cook while breaking it up with a spoon. 3. Once chicken has been cooking for about 5 minutes, add in the diced bell pepper and carrots. Give everything a good stir and continue to cook until chicken is no longer pink. 4. Add in the cashews and red pepper flakes and cook for an additional minute. 5. Add in the sauce and continue to cook for 2 minutes. Be sure to toss everything in the sauce. 6. Remove from heat and stir in the green onions. 7. 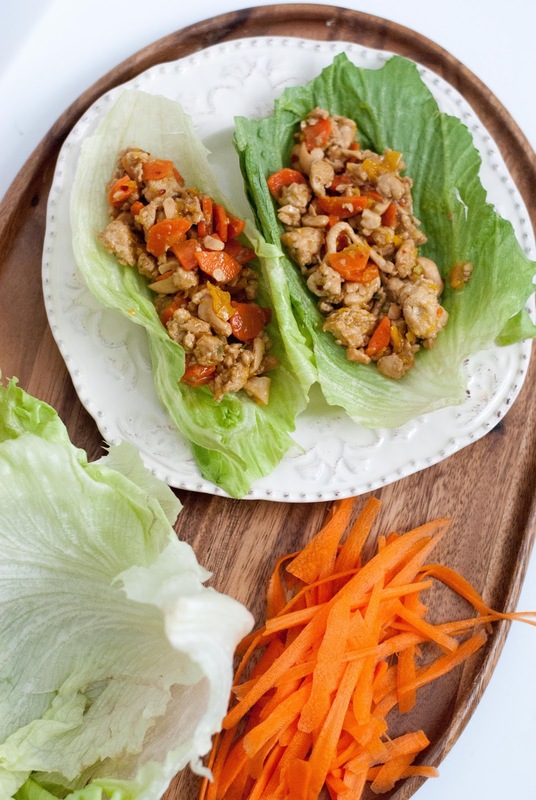 To assemble, top each lettuce wrap with 1/2-2/3 cup of the chicken mixture. Top with green onions and enjoy!